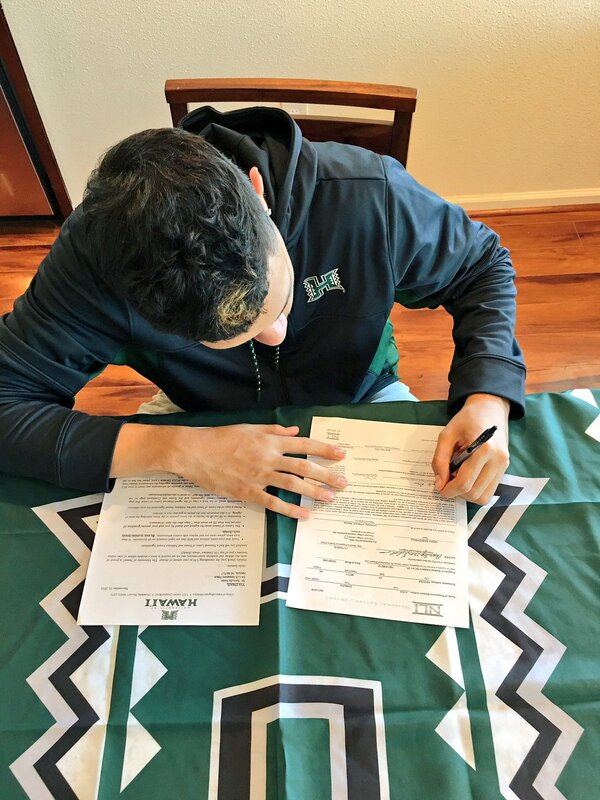 There has been no official confirmation from the University of Hawai’i as of yet, but it appears Kahuku High School’s Samuta Avea has signed a National Letter of Intent to join the Warriors next season. The photo at right was posted on his Twitter page, showing him signing the letter of intent. Avea is an athletic 6-foot-6 guard/forward who led Bingham High School to a state championship in Utah last season. He transferred back to Kahuku for his current senior year of high school. He averaged around 10 points and seven rebounds per game as a junior, and was a second-team all-state pick in Utah. According to recruiting sites, he was also being offered by Wyoming, Montana, UC Davis and Weber State, and several other programs were showing interest. The early signing period for recruits started on November 9 and ends on November 16. This would be a great pickup for Ganot. Hope it’s true.